We all know how popular musician Lady Gaga is, but regardless of the popularity of her music she’s done something that not many other artists can say. She has built a sustainable and massive community around herself. She even gave her fans a name, “Little Monsters”, which they’ve embraced rabidly. At the moment, Lady Gaga has the most numbers of followers on Twitter with 19,049,716 and an astounding 47,725,846 likes on Facebook. The quick math says that’s over 66M separate accounts between the two services that want to interact with all things Gaga. Other than Justin Bieber, we’ve never seen that type of engagement surrounding anyone on any platform. 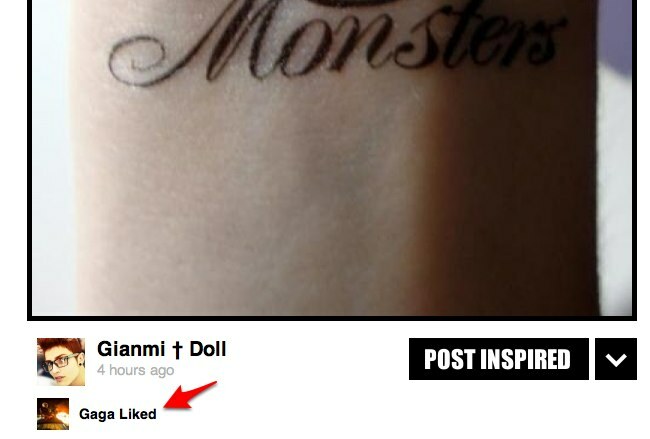 Is Gaga outgrowing existing social networks? While Twitter has a 140 character restraint on messages and Facebook pages only let you do so much, it appears that one company has decided to create a site that is all Gaga all the time. The company is called Backplane and one of its co-founders happens to be Lady Gaga’s manager, Troy Carter. Rather than sitting back and finding ways to draw attention to Lady Gaga’s accounts on social networks, the company has released her own, aptly named “Little Monsters“, which is a cross between Facebook, Pinterest, and yes, even MySpace. The site is in beta right now and is invite-only now. To say the least, it’s the hottest ticket on the web for Lady Gaga fans and if I considered myself a “Little Monster” I’d probably be super excited to be included. While I’m not a huge Lady Gaga fan, I can recognize the trend that Backplane may be starting with this site. Why generate traffic, interest, and interaction on other platforms if you have the star power to have your own? While musicians have had official websites for some time now, they haven’t had a place to intimately interact with their biggest fans. By building on that intimate exchange, you can keep fans at bay while you’re working on a new album, and use your platform to break sales records just by controlling all of the outreach and interaction. What we’re seeing is a new breed of marketing supported by emerging technology. Can you imagine how successful a platform based around say, Michael Jackson or even Madonna would have been? With the artists themselves reaching out to its fanbase with videos, posts, and comments, they’re taking the idea of a “fan” to a whole new level. For those that adore Lady Gaga, being on Little Monsters is like getting an invitation to hang out at her house. Do artists need Twitter and Facebook anymore? While it’s unknown who Backplane will roll this type of site out for next, focusing on the technology behind the scenes and retrofitting the platform for the actual stars who are using it is a brilliant business model. You don’t have to worry about Twitter going down or Facebook rolling out a new feature that everyone doesn’t like, the artist is in control. Twitter and Facebook are a great place to cultivate a fanbase, and without question the virality of shared content won’t have artists jumping ship just yet, but I imagine that in a few years, these artists will be hosting platforms of their own, like Little Monsters, and pushing content to these big social networks. The company will be holding what it’s calling the “Managers Hack” at SXSW this year, which is inviting hackers to come out and build cool things to further music distribution. The company has the team, and the backing to turn the music industry on its ear, and it all goes back to building a fantastic community.